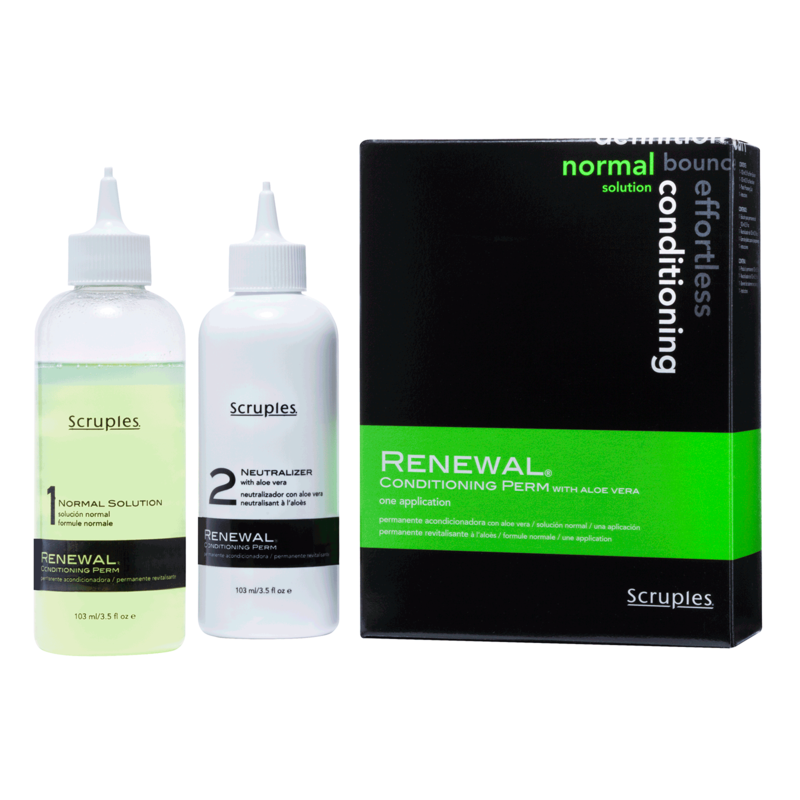 Scruples Renewal Conditioning Perm - Normal protects the cuticle, infuses incredible shine, fuses a silicone shield onto hair and leaves hair conditioned and soft. Aloe Vera soothes hair and creates silky, manageable curls. Choose from 2 formulas – Normal and Tinted. The Normal Formula is for use on normal, resistant, fine, limp, naturally gray, or white hair. The Tinted Formula is for use on color treated (20 volume or less) and highlighted (50% or less) hair. - No test curl is required. - However, for the most precise results, a test curl is recommended on normal and tinted hair. - Neutralize hair for 5 minutes. - 2 formulas – normal and tinted • Normal Formula - for use on normal, resistant, fine, limp, naturally gray, or white hair and Tinted Formula - for use on color treated (20 volume or less) and highlighted (50% or less) hair. - Normal infuses incredible shine and leaves hair conditioned and soft. - Aloe Vera soothes hair and creates silky, manageable curls.